St. Columba, also known as Columcille (which means ‘dove’), together with St. Patrick and St. Brigid are the patron saints of Ireland. A poet and an artist, he founded many communities in Ireland, including Iona in Scotland. This icon is based on a story from his visit to the monastery at Clonmacnoise. A large crowd formed to greet Columba, pressing round to be near his holiness. A troublesome youth of the community, much looked down upon by his seniors, approached from behind, attempting a touch Columba’s garment. The saint noticed the boy, taking hold of him by the neck. The crowd cried to send him away, but the saint hushed them. He had the boy open his mouth, and he blessed his tongue and prophesied that although they scorned and despised him now, from that hour he would cease to displease them; that day by day he would grow in wisdom and be an outstanding figure in the community and great teacher of salvation. In this icon, Celtic calligraphy frames the border, and an image from the Book of Kells (some of the Book illuminations possibly by Columba) forms the arch-like setting. The stone cross is from Clonmacnoise. Communities often gathered at the outdoor crosses for instruction. Columba carries the staff of an abbot and holds Ernan by the neck, blessing him with the other hand. Youths are easily dismissed and disregarded. May we all believe that goodness and giftedness will grow in them in the powerful light of faith. This icon marks the 75th anniversary of St. Columba’s College in Hertfordshire, England in 2014. —His Feast Day is June 9. Ireland has many saints and three great ones: Patrick, Brigid, and Columba (Columkill). Columba outshines the others for his pure Irishness. He loved Ireland with all his might and hated to leave it for Scotland. But he did leave it and laid the groundwork for the conversion of Britain. He had a quick temper but was very kind, especially to animals and children. He was a poet and an artist who did illumination, perhaps some of those in the Book of Kells itself. His skill as a scribe can be seen in the Cathach of Columba at the Irish Academy, which is the oldest surviving example of Irish majuscule writing. It was latter enshrined in silver and bronze and venerated in churches. About the time that Patrick was taken to Ireland as a slave, Columba was born. He came from a race of kings who had ruled in Ireland for six centuries, directly descended from Niall of the Nine Hostages, and was himself in close succession to the throne. From an early age he was destined for the priesthood; he was given in fosterage to a priest. 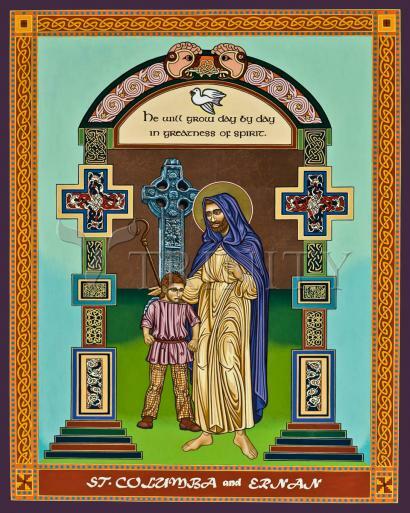 After studying at Moville under Saint Finnian and then at Clonard with another Saint Finnian, he surrendered his princely claims, he became a monk at Glasnevin under Mobhi and was ordained. He spent the next 15 years preaching and teaching in Ireland. As was the custom in those days, he combined study and prayer with manual labor. By his own natural gifts as well as by the good fortune of his birth, he soon gained ascendancy as a monk of unusual distinction. By the time he was 25, he had founded no less than 27 Irish monasteries, including those at Derry (546), Durrow (c. 556), and probably Kells, as well as some 40 churches. Columba was a poet, who had learned Irish history and poetry from a bard named Gemman. He is believed to have penned the Latin poem Altus Prosator and two other extant poems. He also loved fine books and manuscripts. One of the famous books associated with Columba is the Psaltair, which was traditionally the Battle Book of the O'Donnells, his kinsmen, who carried it into battle. The Psaltair is the basis for one of the most famous legends of Saint Columba. It is said that on one occasion, so anxious was Columba to have a copy of the Psalter that he shut himself up for a whole night in the church that contained it, transcribing it laboriously by hand. He was discovered by a monk who watched him through the keyhole and reported it to his superior, Finnian of Moville. The Scriptures were so scarce in those days that the abbot claimed the copy, refusing to allow it to leave the monastery. Columba refused to surrender it, until he was obliged to do so, under protest, on the abbot's appeal to the High King Diarmaid, who said: "Le gach buin a laogh" or "To every cow her own calf," meaning to every book its copy. An unfortunate period followed, during which, owing to Columba's protection of a refugee and his impassioned denunciation of an injustice by King Diarmaid, war broke out between the clans of Ireland, and Columba became an exile of his own accord. Filled with remorse on account of those who had been slain in the battle of Cooldrevne, and condemned by many of his own friends, he experienced a profound conversion and an irresistible call to preach to the heathen. Although there are questions regarding Columba's real motivation, in 563, at the age of 42, he crossed the Irish Sea with 12 companions in a coracle and landed on a desert island now known as Iona (Holy Island) on Whitsun Eve. Here on this desolate rock, only three miles long and two miles wide, in the grey northern sea off the southwest corner of Mull, he began his work; and, like Lindisfarne, Iona became a center of Christian enterprise. It was the heart of Celtic Christianity and the most potent factor in the conversion of the Picts, Scots, and Northern English. Columba built a monastery consisting of huts with roofs of branches set upon wooden props. It was a rough and primitive settlement. For over 30 years he slept on the hard ground with no pillow but a stone. But the work spread and soon the island was too small to contain it. From Iona numerous other settlements were founded, and Columba himself penetrated the wildest glens of Scotland and the farthest Hebrides, and established the Caledonian Church. It is reputed that he anointed King Aidan of Argyll upon the famous stone of Scone, which is now in Westminster Abbey. The Pictish King Brude and his people were also converted by Columba's many miracles, including driving away a water "monster" from the River Ness with the Sign of the Cross. Columba is said to have built two churches at Inverness. Just one year before Columba's migration to Iona, Saint Moluag established his mission at Lismore on the west coast of Scotland. There are constant references to a rivalry between the two saints over spheres of influence, which are probably without foundation. Columba was primarily interested in Gaelic life in Scotland, while Moluag was drawn to the conversion of the Picts. While leading the Irish in Scotland, Columba appears to have retained some sort of overlordship over his monasteries in Ireland. About 580, he participated in the assembly of Druim-Cetta in Ulster, where he mediated about the obligations of the Irish in Scotland to those in Ireland. It was decided that they should furnish a fleet, but not an army, for the Irish high-king. During the same assembly, Columba, who was a bard himself, intervened to effectively swing the nation away from its declared intention of suppressing the Bardic Order. Columba persuaded them that the whole future of Gaelic culture demanded that the scholarship of the bards be preserved. His prestige was such that his views prevailed and assured the presence of educated laity in Irish Christian society. He is personally described as "A man well-formed, with powerful frame; his skin was white, his face broad and fair and radiant, lit up with large, gray, luminous eyes..." Saint Adamnan, his biographer wrote of him: "He had the face of an angel; he was of an excellent nature, polished in speech, holy in deed, great in counsel... loving unto all." It is clear that Columba's temperament changed dramatically during his life. In his early years he was intemperate and probably inclined to violence. He was extremely stern and harsh with his monks, but towards the end he seems to have softened. Columba had great qualities and was gay and lovable, but his chief virtue lay in the conquest of his own passionate nature and in the love and sympathy that flowed from his eager and radiant spirit. On June 8, 597, Columba was copying out the psalms once again. At the verse, "They that love the Lord shall lack no good thing," he stopped, and said that his cousin, Saint Baithin must do the rest. Columba died the next day at the foot of the altar. He was first buried at Iona, but 200 years later the Danes destroyed the monastery. His relics were translated to Dunkeld in 849, where they were visited by pilgrims, including Anglo-Saxons of the 11th century. The year Columba died was the same year in which Saint Gregory the Great sent Saint Augustine of Canterbury to convert England. Perhaps because the Roman party gained ascendancy at the Synod of Whitby, much of the credit that belongs to Saint Columba and his followers for the conversion of Britain has been attributed to Augustine. It should not be forgotten that both saints played important roles. Saint Columba is also important as patron of the Knights of Saint Columba, known in the United States as the Knights of Columbus and by other names in various parts of the world. Like Saint Malachy, whose apocryphal prophecies concerning the succession of popes are universally known, Saint Columba left a series of predictions about the future of Ireland. These were published in 1969 by Peter Blander under the title, The Prophecies of Saint Malachy and Saint Columbkill. Unsurprisingly, devotion to Columba is especially strong in Derry. On April 13, the king signed the Catholic Emancipation Act in London. On that same day in Derry, the statue of a Protestant leader of the siege of Derry, which stood on the city walls was smashed apart of its own accord. The destruction of this symbol of dominion was attributed to the intercession of Saint. The following legends about Saint Columba are the gentlest things recorded about the heroic and tempestuous abbot who founded Iona. The countryside where he was fathered is Gartan in Donegal, at the ingoing of the mountains and the great lake; a gentle countryside, and more apt a birthplace for the bird than the saint. The life written about 690 by Saint Adamnan, himself an Irishman and an abbot of Iona, is a rugged piece of work: but the deathdays of Saint Columba, and the crowding torches that discovered him dying in the dark before the high altar at midnight on June 9, are one of the tidemarks in medieval prose. The work itself owes much to Adamnan's imagination and more to unreliable sources, but it is a primarily a narrative of the miracles worked through Columba. In the first story Columba bids his brother monk to go in three days to a far hilltop and wait, "'For when the third hour before sunset is past, there shall come flying from the northern coasts of Ireland a stranger guest, a crane, wind tossed and driven far from her course in the high air; tired out and weary she will fall upon the beach at thy feet and lie there, her strength nigh gone. Tenderly lift her and carry her to the steading near by; make her welcome there and cherish her with all care for three days and nights; and when the three days are ended, refreshed and loath to tarry longer with us in our exile, she shall take flight again towards that old sweet land of Ireland whence she came, in pride of strength once more. And if I commend her so earnestly to thy charge, it is that in the countryside where thou and I were reared, she too was nested.'" The brother obeyed and all happened as Columba had foretold. "And on his return that evening to the monastery the Saint spoke to him, not as one questioning but as one speaks of a thing past. 'May God bless thee, my son,' said he, 'for thy kind tending of this pilgrim guest; that shall make no long stay in her exile, but when three suns have set shall turn back to her own land.'" And so it happened. "Columba was troubled; he could see plainly that the little girl was miserable. So he asked the druid to give her freedom and he would get her home to Ireland. The druid refused. Columba went away with a picture of an unhappy little girl in his mind. "Shortly afterward, the important druid became ill; there was nobody near to tell him what to do to get well so he sent for the Abbot of Iona, who had a great reputation for curing people. Columba did not leave Iona but sent a message back that he would cure the druid if he let the little girl free. "The druid was angry and again refused. 'What on earth is he troubling himself for about that little bit of a good-for-nothing?' grumbled the druid as he tossed about in bed. But the messenger had hardly left for Iona with the refusal when the druid got worse; he had much pain and he thought he would die. So he sent off another message to Columba: 'Yes, you can have the slave-girl, only come and do something for me. I am very bad and will die if you don't come soon.'" Columba, however, did not trust the priest, so he sent two of his monks to bring the girl back. When the girl was safe, Columba set out for the druid's house and cured him of his sickness. Died: June 9, 597 at Iona, Scotland, and is buried there. The holy Columba was born of noble parents, having as his father Fedelmith, Fergus' son, and his mother, Ethne by name, whose father may be called in Latin "son of a ship," and in the Irish tongue Mac-naue. In the second year after the battle of Cul-drebene, the forty-second year of his age, Columba sailed away from Ireland to Britain, wishing to be a pilgrim for Christ. Devoted even from boyhood to the Christian noviciate and the study of philosophy, preserving by God's favour integrity of body and purity of soul, he showed himself, though placed on earth, ready for the life of heaven; for he was angelic in aspect, refined in speech, holy in work, excellent in ability, great in counsel. Living as an island soldier for thirty-four years, he could not pass even the space of a single hour without applying himself to prayer, or to reading, or to writing or some kind of work. Also by day and by night, without any intermission, he was so occupied with unwearying labours of fasts and vigils that the burden of each several work seemed beyond the strength of man. And with all this he was loving to everyone, his holy face ever showed gladness, and he was happy in his inmost heart with the joy of the Holy Spirit.